WesternWhiskies.com: Well I'll be darned! A few weeks ago most of you will recall the article on T. G. Cockrill & Co., Kentucky Gem and the apparent discrepancy in the addresses that Thomas listed for the enterprise. Attached to the article was a copy of the Sanborn map for Front St. The map showed a number of Wholesale Liquor dealers and Rectifiers lined up like Indians on Front St. I thought that it would be interesting to put names on the addresses so I started researching. The results were a veritable who's who of power liquor dealers. One especially caught my interest since I'd recently acquired a labeled Tea Kettle, which I also posted in a previous article. Photo printed by permission of a descendant of James Shea. KG: Your photo dates between 1896-98 when M. Gruenberg was located at 525 Front, next door to Shea Bocqueraz & Co., who were on the very corner at 527 Front. The corner bldg was divided into two businesses and two addresses. The two liquor dealers were actually next door to each other for those three yrs. 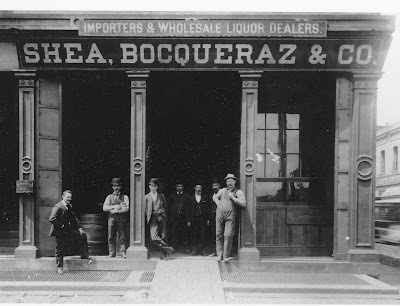 In 1899 Shea Bocqueraz & Co moved to 525 Market St. In 1903 they dropped the "&" from the Co. and were still at the Market St address. My name is charlie and I live in Napa, Ca. A couple of months back I was doing some Creekside digging in Yountville,Ca and found a coffin flask, (clear, half pint)embossed Newmark Gruenberg & Co. A.A.A. I'm looking for more information on the bottle, the company, and the whiskey.